Finasteride Propecia Testosterone and Libido! I'm going to give you several VERY good reasons why you want to avoid this drug in just a moment, but first, let's talk about what it does inside your body. Finesteride, (also know as propecia and proscar) is an anti-androgenic drug which inhibits 5 alpha-reductase, the enzyme responsible for converting testosterone into dihydrotestosterone (DHT). It's typically used for the prevention of hair loss or baldness, and to help reduce the size of the prostate. 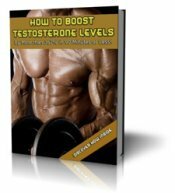 This drug is highly effective at stopping the conversion of testosterone into DHT. You do not want to turn off DHT production. Your body produces it for a very good reason. Finasteride effects male function on several different levels. DHT, estrogen, testosterone, are all impacted by this drug. Keep in mind, some men do OK on it, but many others do not. Your manhood is at stake here, and it may not be worth the risk! If you're taking this drug, you should stop. If you are thinking about using it, think twice. Remember, there are other options! For baldness a topical solution is a better choice. There will be minimal side effects as only a small amount of the solution enters the bloodstream. This Extra Strength Rogaine receives very high marks from users. Follow the link and scroll down to read the reviews.